Being the youngest of all siblings comes with its own set of privileges. They are the most pampered and they can get away with anything and everything while the elder siblings are always there to protect them, and entertain their whims and fancies. It’s all so true in the case of Wah Wah Gee who have just welcomed the addition of a younger sibling. Introducing Wah Bah; the cheeky, loud and boisterous younger sibling of the popular Asian Geelong waterfront restaurant and Geelong’s newest nightspot. Perched out on a Cunningham Pier, Wah Bah boasts a menu based on Wah Wah Gee’s all-time favourites; the forever loved Bao Buns. Featuring a dedicated Bao Bun Menu, you’ll find all the classics with a twist such as spiced pulled pork, a fun nacho bun and there’s a delicious mushroom bao bun (soy braised crispy mushroom with rocket, red onion marmalade and blue cheese sauce) which has proved to be a serious crowd favourite. We currently have our hearts set on the Parmi bun, the burger bao (burger pattie with burger sauce and salad) and the Wah Wah Gee all-time favourite Crispy Chicken Bao. They’ve even got a few new additions for the summer time, including a vegetarian Bao Bun option – Broccoli Pakora with satay aioli. Yum! 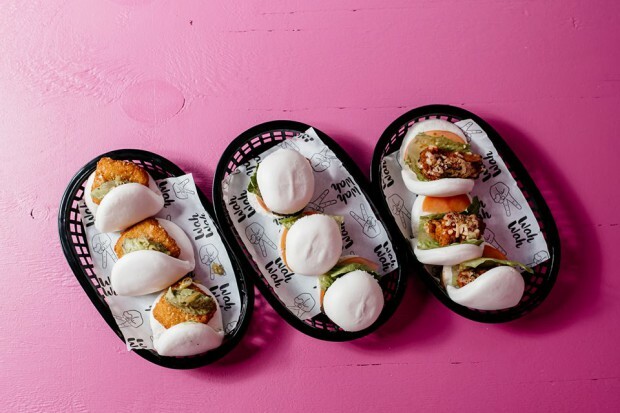 Backing the old wives’ tales saying that the babies of the family are more attention-seeking, fun and rebellious, Wah Bah have introduced Wah Wednesdays, offering $3 buns from 12pm until late. How’s that for a hump day treat?! Choose from any of the buns, pair it with a cocktail, sit on the deck and you’ll be happy as Larry! But say bao isn’t really your thing? No stress, they’ve got heaps of other options for you to enjoy. Take your pick from a number of generous sized salads (the Ceas-wah is our pick with broccoli, cos lettuce, bacon lardons and chicken salt roti crisps with caesar dressing), or indulge in a selection of ‘Bah bites’ with classic like chips and sweet potato wedges, or try their Korean fried cauliflower and soy braised crispy mushrooms. If you fancy something more substantial, guests are more than welcome to dine in the full restaurant downstairs and venture back upstairs for a drink or seven after. And for those that truly want to live their best life, the dessert menu has just what you’re looking for this summer. From mini doughnuts rolled in cinnamon sugar, to the five-spice chocolate brownie, or even the ‘Wah tah mess’ (rippled meringues with lemon cream, berries and raspberry sorbet), you’ll want to treat yourself time and time again. With the bayside views, bold neons, vibrant feature artwork and Dj’s spinning the decks Thursday to Sunday, Wah Bah provides the perfect space for all those functions and events that pop up over summer (Hen’s parties, we’re looking at you!). Embracing the good vibes, Wah Bah makes life easy with their function platters which boast a medley of Wah favourites, including a ‘cute bun platter’ which includes nacho buns, parmi buns and cheese burger buns. If you’ve got an event coming up and you’ve been donned the organiser hat, pop in and chat to the team who will take that weight right off your shoulders. With stunning blue skies and chilled vibes, we couldn’t think of anything we’d rather be doing than soaking up the sun, cocktail in hand, bun in the other. See you at the Bah!